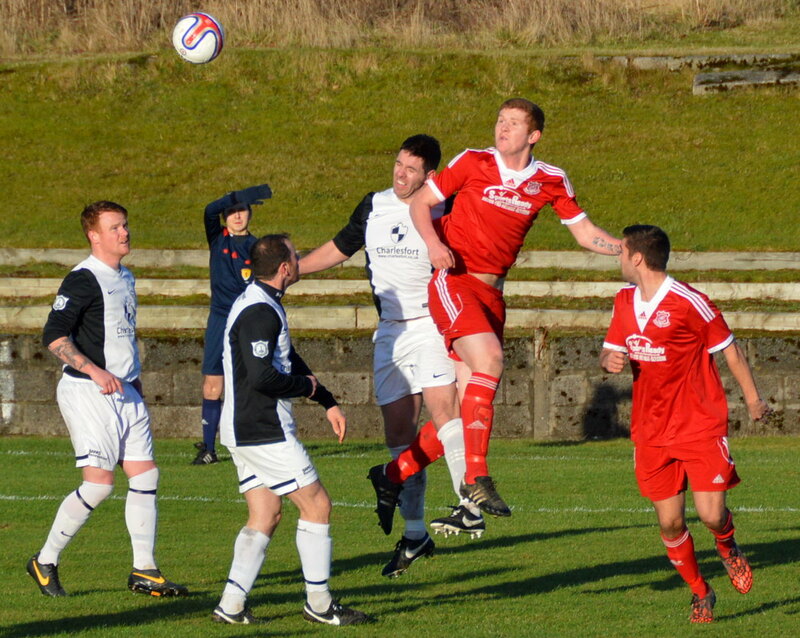 Glenafton welcomed neighbours as 2015 first footers to Loch Park and also welcomed back midfielder Jamie McKernon to the starting line-up with striker Alain Kinney taking a place on the bench. 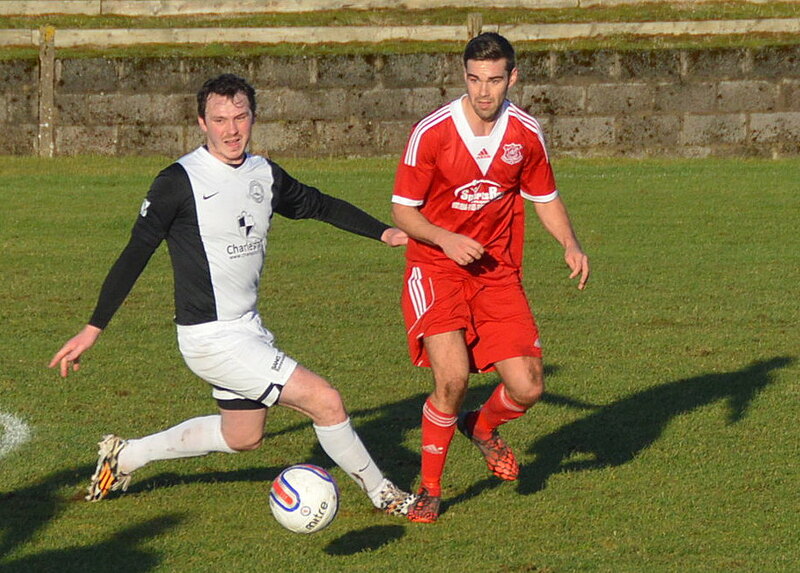 The marked contrast between the strong sunshine and the cold air the engulfed Loch Park was equalled by the contrast of a scrappy first half and incident packed second. 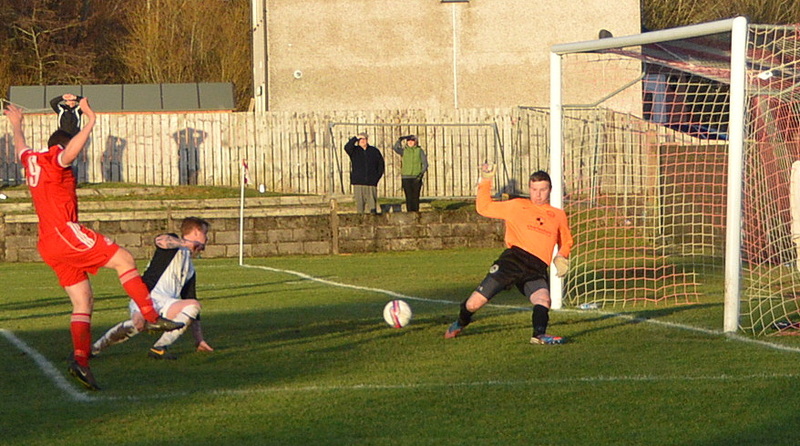 Cumnock who made the more purposeful start took the lead on 9 minutes after an attempted clearance in the box by Craig Menzies fell kindly for Robert Love who quickly engineered a fine flashing shot and although keeper Brian McGarrity had appeared to push the ball wide of the far post it deflected off defender Jamie McGeoghegan and into his own net. Although the home side had earned a couple of set-pieces in dangerous places , all of which failed to test the keeper, they were struggling to create any chances from open play until the 19th minute. Adam Strachan ghosted down the left flank and although his cut-back across the face of goal was cleared by the head of Stephen Low the loose ball was met by Michael Wardrope at the outskirts of the box and his scorching shot was pushed over the bar courtesy of an acrobatic save from Ally Semple. Again the resultant corner-kick was mopped up by the ‘Nock defence and soon after Semple comfortably saved a McGill free-kick from 25 yards out. 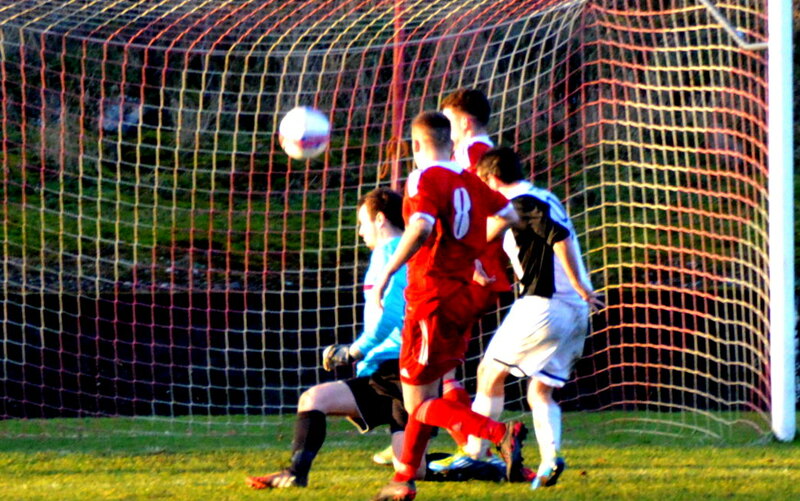 Glenafton continued to press for the equaliser but still their only rewards were what proved to be non-threatening corner kicks while Cumnock always looked dangerous on the break down both flanks with their best chance of adding to their lead coming 10 minutes before the break. 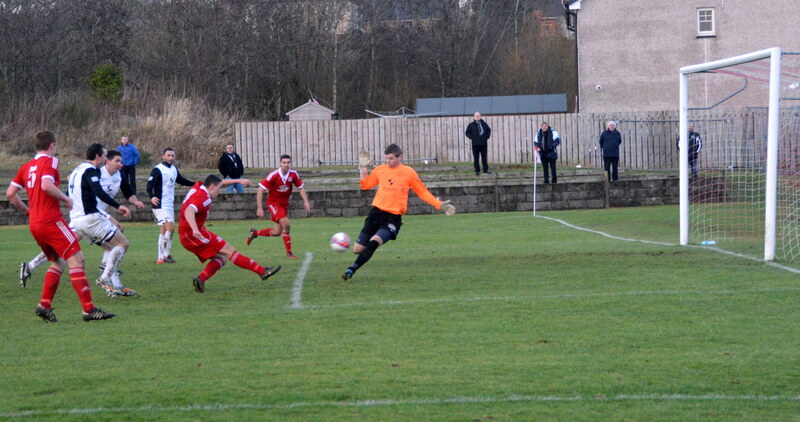 A clever pass from Ray Montgomerie deep in the Glen’s box set Love free to cut the ball back from the dead-ball line which was headed clear at the near post by Ryan McChesney as Montgomerie waited to put the finishing touches to the one-two. From the resultant corner kick Stephen Low came out on top in the aerial battle but his header flashed inches over McGarrity’s bar. Just before the break Cumnock replaced the injured Adam Lowe with Chris McKnight and brought on trialist Duches for Nisbet at the interval while the hosts brought on Alain Kinney for Wardrope and Daniel Orsi for Menzies. The visitors started brightly and McChesney made a crucial intervention in the box to cut out Ronald’s pass to Love and soon after another ‘Nock moved ended with Tony Low trying his luck from distance only for the ball to sail harmlessly over the bar.As the half progressed yellow cards were being produced at regular intervals as the intensity and the tempo of the game increased and tempers were being kept in check. On 55 minutes a Kinney drive from 30 yards was well held by Semple and a minute later the keeper denied the striker again, clutching his header from a corner kick. Glens continued to press and Semple sprinted off his line to dive at the feet of Kinney and within a flash the loose ball was played back into the box and landed at the feet of Kinney again and his low angled shot from 12 yards was brilliantly block by the outstretched leg of Semple. The sucker punch was delivered on the hour mark. Love bombed down the right flank and clipped a wicked ball into the six yard box and although it was missed by the incoming Montgomerie it rolled into the path of Tony Low and his low drilled shot beat keeper McGarrity and was then diverted into goal by Ray Montgomerie. 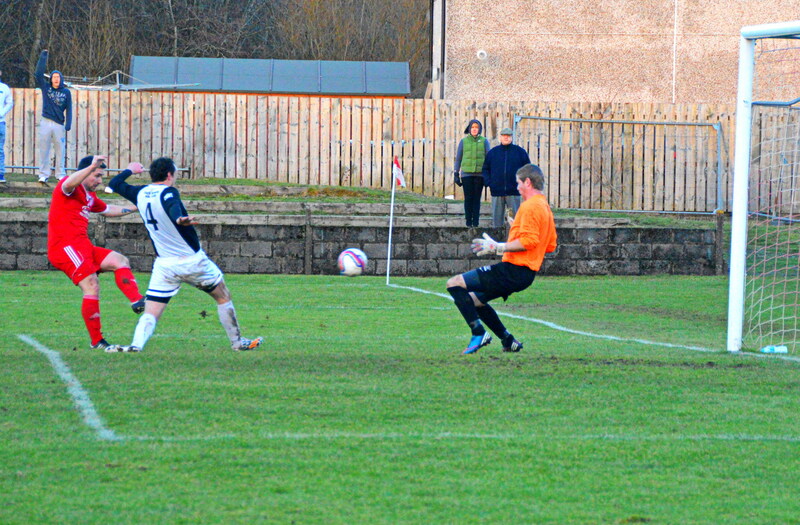 Claims for offside were waved away and Cumnock doubled their lead. Glens responded well and three minutes later a rasping free-kick by Strachan from 25 yards out was tipped over the bar by Semple and as the home side continued to press a wicked ball by McKernon from wide on the right was headed wide by Kinney. 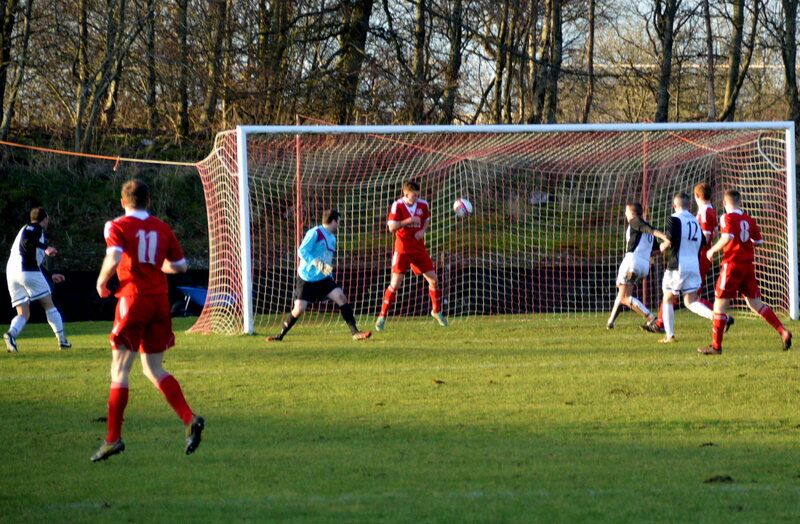 A low drilled shot from Strachan then whizzed past the post. Another Glens’ attack was broken down on the half way line McKnight played a one-two with Adam Loew before driving into the penalty box and squaring the ball for the incoming Robert Love who gave a defender the slip before firing for goal only for the ball to cannon off the leg of the out-rushing McGarrity and loop high over the keeper’s head into the gaping net. 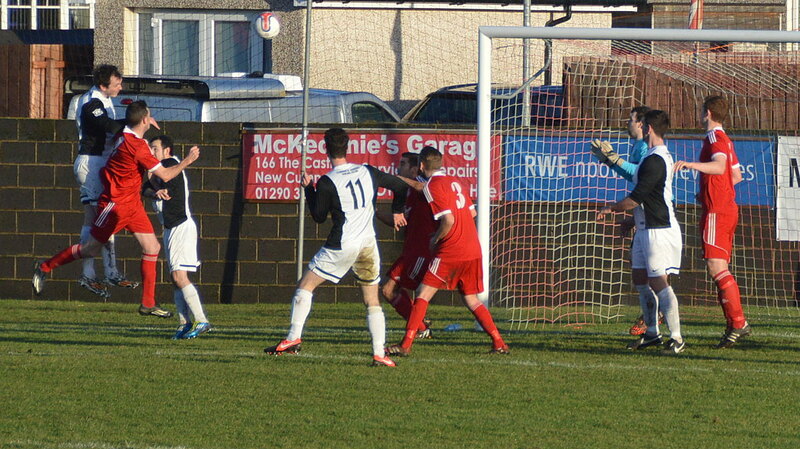 Cumnock now 3-0 up after 74 minutes. 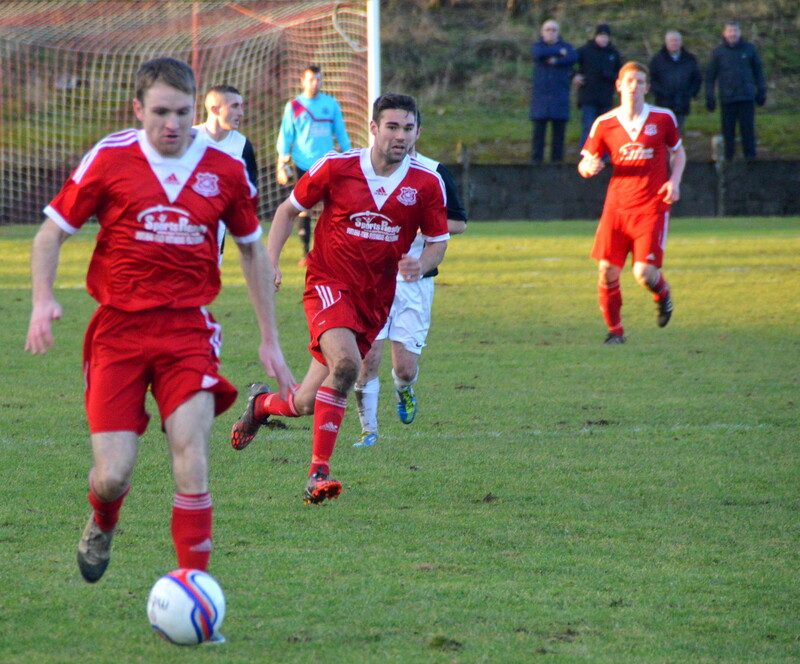 Glenafton replaced defender Alan Cairns with Chris Meikle and to their credit picked themselves up and went in search of some consolation and ten minutes later they pulled one back. Connolly’s shot from 25 yard outs was pushed round the post by Semple at full stretch. The keeper’s mistimed his two-fisted punch at the resultant corner kick and the ball barely made it out the penalty box where McChesney played a big part in returning the ball into the mix where it fell for Alain Kinney to blast home from the corner of the six yard box. The visitors’ offside appeals promptly dismissed. The home side’s thoughts of consolation turned to those of salvation when they scored again on 86 minutes. A corner kick was headed clear to the right hand corner of the penalty box and in an instant Orsi lashed the ball low and hard back to from where it came to connect with the outstretched foot of Aaron Connolly to slip the ball beyond Semple rooted to his line.